Kolkata, Oct 26 (IANS) Even if his contract is over after the FIFA U-17 World Cup, India U-17 and U-19 coach Luis Norton de Matos can continue if he wants, All India Football Federation (AIFF) President Praful Patel said on Thursday. “De Matos has done a great job for the Indian team. I have complimented him. His contract is till the end of this World Cup. He is with the U-19 team. We will talk about this (extension of contract). 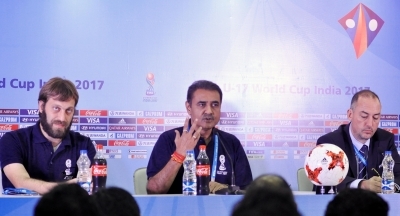 If he is ready, India has a big heart to accept him,” Patel told reporters at the FIFA U-17 World Cup wrap-up press meet. Portugal’s de Matos was the coach of the Indian team in the FIFA U-17 World Cup and is currently with the national U-19 team that will take part in the AFC U-19 Championships qualifiers in Saudi Arabia next month. Patel added that replacing Nicolai Adam as the India U-17 team coach had to be done keeping in mind the circumstances. “We had to change the coach. I am not saying that the past coach (Nicolai) was not up to mark. Both the coaches did a fine job. The day you find the players unhappy, there is no point continuing with the coach. You cannot have a disconnect with the coach and players. It would have been a disaster (to continue with Nicolai),” Patel said.